So this pic of Obama and the fam is floating through the cell phone highway attached to the theme song of The Jeffersons. You know the one "well, we're moving on up to the eastside. To a de...luxe apartment in the s...k..y..yy..." Hey, I like the thought of upgrading, getting our bars up, taking it to the next level and most of all luv the fact that our president elect is Barack Obama, yes I voted, and all that but the theme song to The Jeffersons? I don't know about that one. It seems to detract from the big picture. 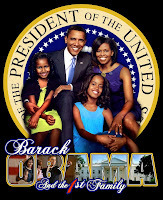 Anywho, I luv this pic of the Obamas and props to whomever did the graphics on this pic from the photo to the lettering. This is a good one. This is my fav. Obama pic also. I wanted to get a sweatshirt of this for the inauguration because I'll be out there amongst the millions...but the one I saw...(I loved it)..however, I kept looking and looking at it like something isn't right. I finally figured it out..the idiots had "inauguration" spelled incorrectly. GO FIGURE!! !